The 2018 edition of the MT2554 Value innovation course featured a total of 8 projects in collaboration with 5 company partners. The course is offered to students in the Master Programme of Mechanical Engineering and Industrial Economy. It builds on the Design Thinking Methodology and gives participants the opportunity to experience the development of new products and services “in real life”, collaborating with companies and organisations in the Blekinge region. The “trenching technology design challenge” for fiber optic installation. The team was challenged with the design of a solution for improving the trenching operations (schakting) for fiber optic installation. The students gathered needs from machine operators and other stakeholders, benchmarked existing solutions, and got inspired by biomimicry to develop an innovative concept to reduce the installation cost for fiber optic cables under roads and parking lots. The team was challenged with the design of a more satisfying broadband experience for users in Karlskrona’s archipelago and rural areas. The students gathered needs from users and other stakeholders concerning internet usage habits. They further analyze trends for innovative internet services, resulting in the development of an IoT demo house (and related compendium) as a pedagogical tool to raise awareness among the target group of the incumbency of smart technologies in their daily life. The team was challenged with the design of a better user experience of the Karlskronaportal service. The students gathered expectations and needs from users, mapped their journey with the different functions in the portal, and developing a package of solutions to ease selection of internet providers depending on the user internet habits. The two team were challenged with the design of electrical solution for an asphalt compactor. 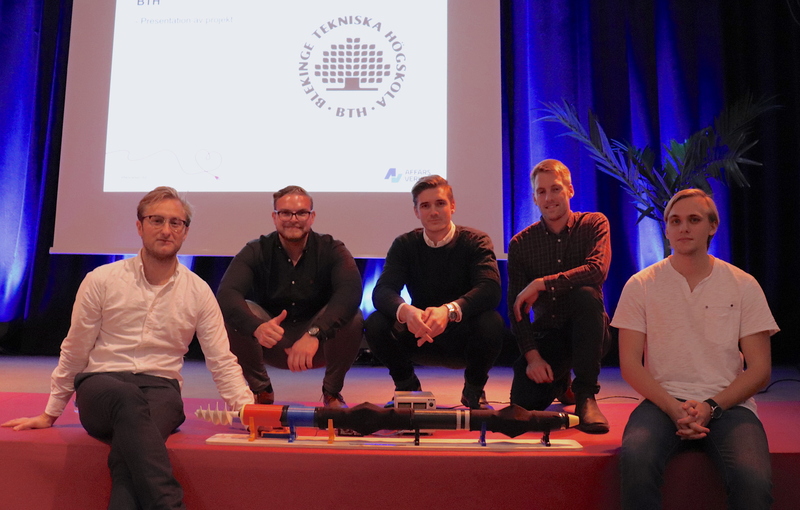 The students gathered user needs, mapped existing compaction processes in relevant applications, benchmarked technologies for electrical propulsion in the construction sector and developed an electrification concept for double drum asphalt rollers. The team was challenged with the design of battery swap solution for compaction equipment. The students gathered needs from manufacturing and operation stakeholders, mapped existing swapping technologies in relevant applications, and proposed a system to ease the replacement of battery cells from electric machines. The team was challenged with the design the World Heritage Site experience for Karlskrona’s citizens, tourists and visitors. The work brought to the development of a prototype for a geolocation and augmented reality game, which is intended to leverage interest of Karlskrona’s heritage among youngsters. The last 2 projects in this list are part of a larger European initiative named ‘Social Inkludering och Tillväxt i Blekinge’, which is coordinated by Coompanion Blekinge. You can read more about this initiative at this link. The team was challenged with expanding the business offer for Retroverket in Karlshamn by offering its customer an even more value adding, socially responsible retail experience. The market analysis brought to the definition of 2 design concepts, one focused on the incremental improvement of the existing offer, and one radical design on the theme of “anger room”. The team was challenged with designing a multi-purpose service centre for rural communities in Kyrkult, Olofström Kommun. By means of questionnaire and interviews, the team explored needs and preferences of local population and potential tourists. This brought to the development of a concept for an adventure park on the theme of “Ninja Warriors”, coupled with a convenience store and fully automated gas station.